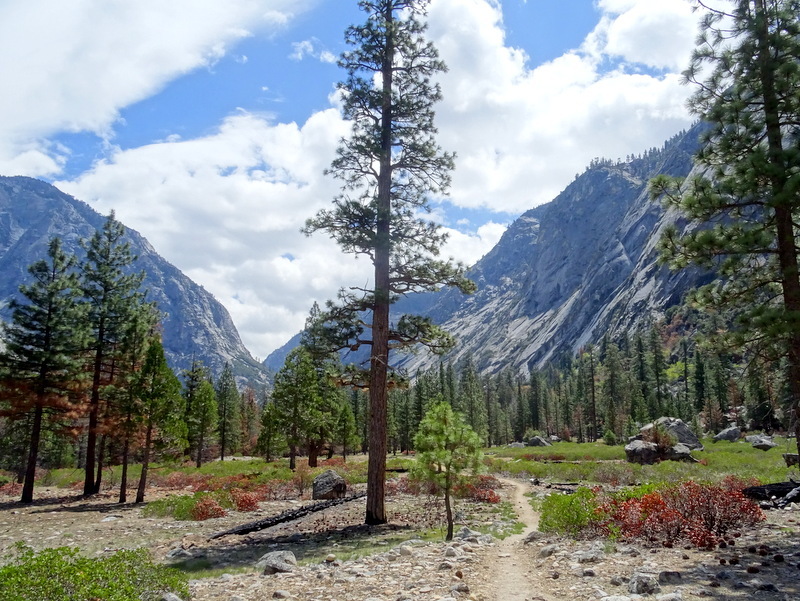 While often referred to as King’s Canyon & Sequoia National Park, they are actually two separate parks connected by one road. One step, narrow and winding road where vehicles over 22-feet long are not allowed to travel. After driving the road in our truck while a rental class C RV behind us (which looked longer than 22′) barely made it around the corners and past the lengthy section of construction where the road is down to one very narrow lane, I can confirm… not suitable for large vehicles. That meant from the Horse Creek Campground near the southern entrance to Sequoia NP we had to drive west to Visalia and then north and back east to reach King’s Canyon. It might have been the long way around, but it gave us a chance to stock up on groceries before spending eight nights in an area where the nearest grocery store was 45 minutes away. Our destination was the Azalea campground inside the park. Operating on a first-come, first-serve basis, this campground is open year-round and offers a selection of wooded sites. We drove all the loops before settling on a mostly level site near the edge of a small meadow. We picked the site thinking it would get a good amount of solar power. Ummm…not so much. I guess it’s been awhile since we parked in a real forest and our estimation of the sun’s path was pretty far off. In addition to our rooftop solar panels, we also have a 100-watt portable for just these kind of places. The portable was added to our solar set-up this summer and we used in the late fall and early winter during those short solar days when the sun is low in the sky. Since the end of January, we haven’t needed it to pull it out and this would be our first time using it in the trees. Despite the fact that Tim had to go out and move it around every 30 minutes or so because the sun was so spotty, and despite the drop in temps at the end of the week that resulted in lots of battery draining furnace usage, we managed to make it through the whole week without pulling out the generator. 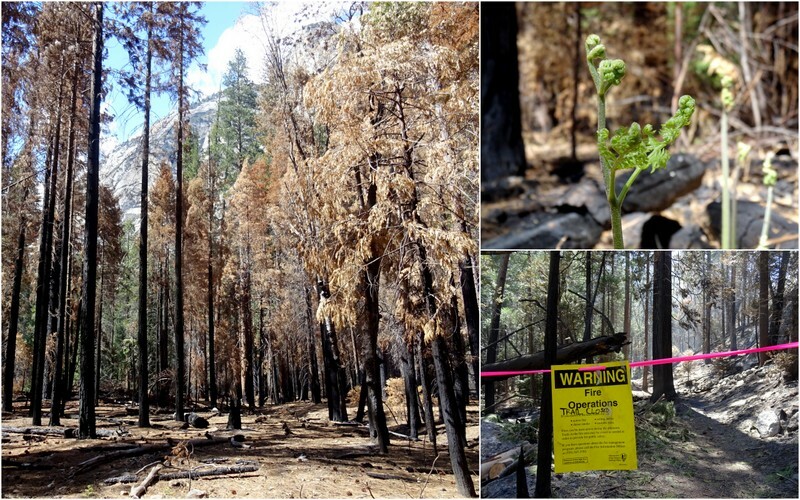 The campground area of Kings Canyon NP is up above 6,000 feet which makes coming here at the end of April a bit of risk. We had been watching the weather and when the daytime temps rose from the 40s to the 60s it seemed safe. Things were great until near the end of the week when the cold and fog rolled in. We had two days in a row when it never got warmer than 45-degrees… during the day. The cold happened to coincide with some long work days so we just stayed inside and piled on the layers. I also cranked up the oven and baked some tasty treats (like these Banana Oatmeal Blueberry Bars) which went a long way towards warming up our tiny home. Before the cold arrived, we spent several glorious afternoons exploring the park. First up was the General Grant tree. Like General Sherman, this one ranks somewhere near the top of the biggest trees list. There is a short walking loop around the grove where you can see the General along with some other famous trees. 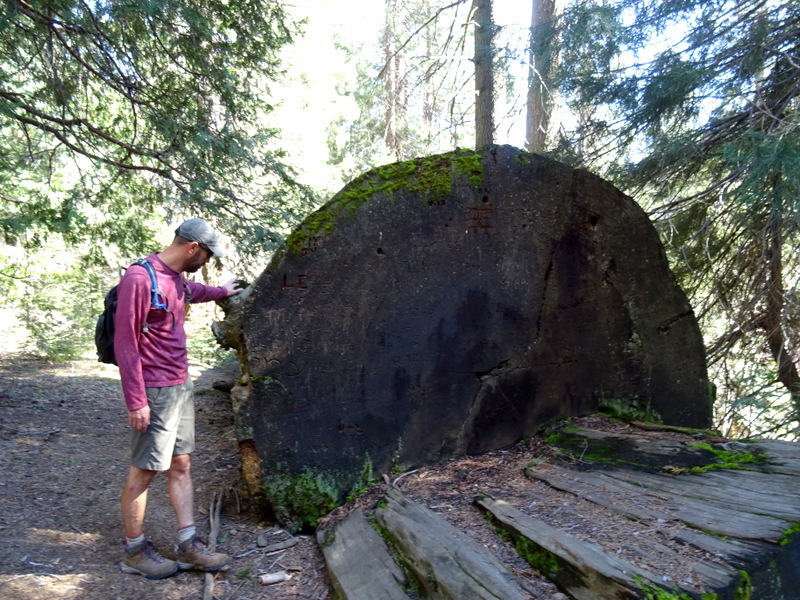 Trees like the Fallen Monarch — a fire-hollowed fallen sequoia, used during a short period as housing by a pair of early settlers. Also on the trail is the Centennial Stump. This very large stump is all that remains of a sequoia that was cut, split into sections, and reassembled at the World’s Fair in Philadelphia in 1876. It’s kind of sad story because, despite the needless destruction of the tree, most people didn’t believe it was real and it became known as a “California Hoax”. Another must-see spot not far from the campground is the Panoramic viewpoint picnic area. 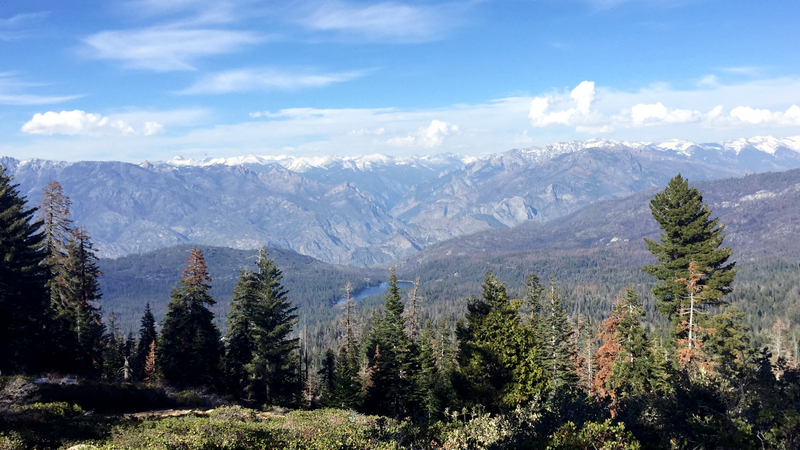 As the name suggests, it’s a great spot to take in a sweeping view of the majestic Sierra Nevada Mountain Range. The road up to the picnic area was still closed for the season so we walked two miles to the top to take in the view. 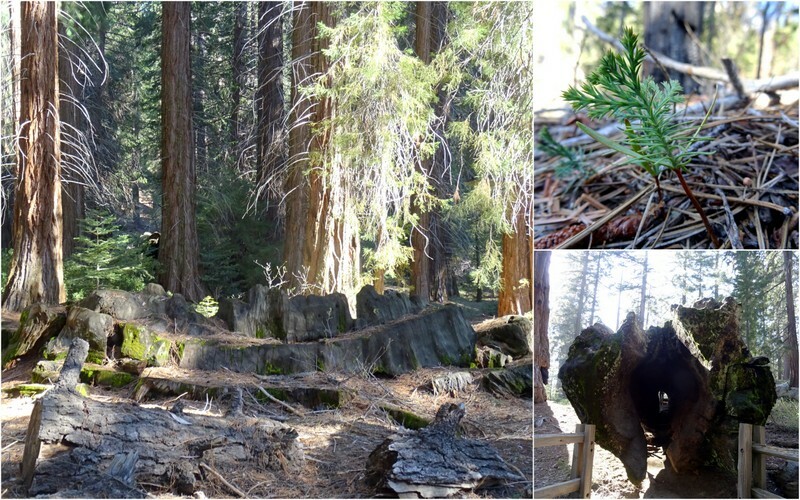 Redwood Canyon Grove is located about 30 minutes south of the Kings Canyon Visitor Center. Here you will find such beauties as the Hart Tree, the Tunnel Tree, and the Log Cabin. 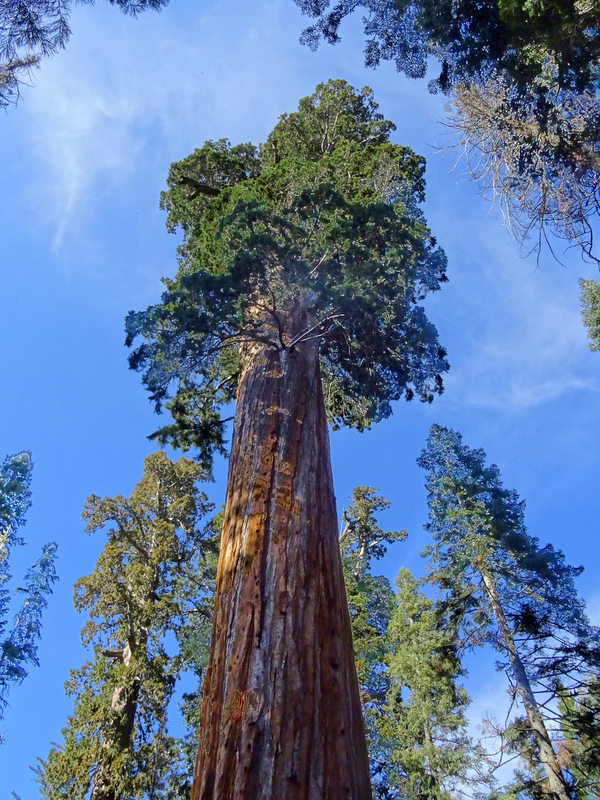 Not only is this is one of the largest sequoia groves in the forest, it is also seldom visited by the hordes of tourists who flock to the Grant Tree. We drove down there one day after work and squeezed in a fairly easy, yet completely magical, 7-mile loop around the Hart Trail before it got dark. We did not see another hiker the whole time. We did see a family of bears though! They were moving too fast for me to get a photo, but we were thrilled nonetheless to see a mama black bear and her two cubs scampering off in the distance. 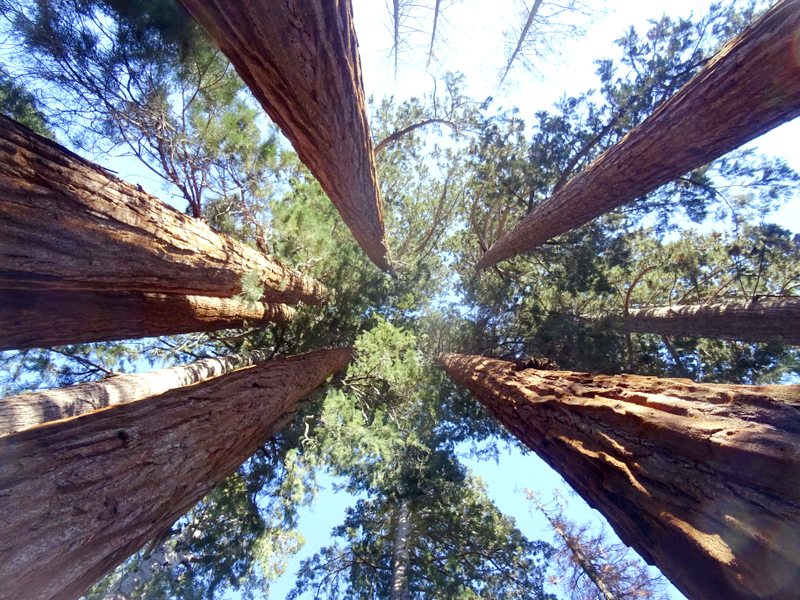 Not only does this park have groves of giant Sequoias, it also has a giant canyon! Kings Canyon was carved by glaciers millions of years ago and today the granite walls tower 4,000 feet above the canyon floor. 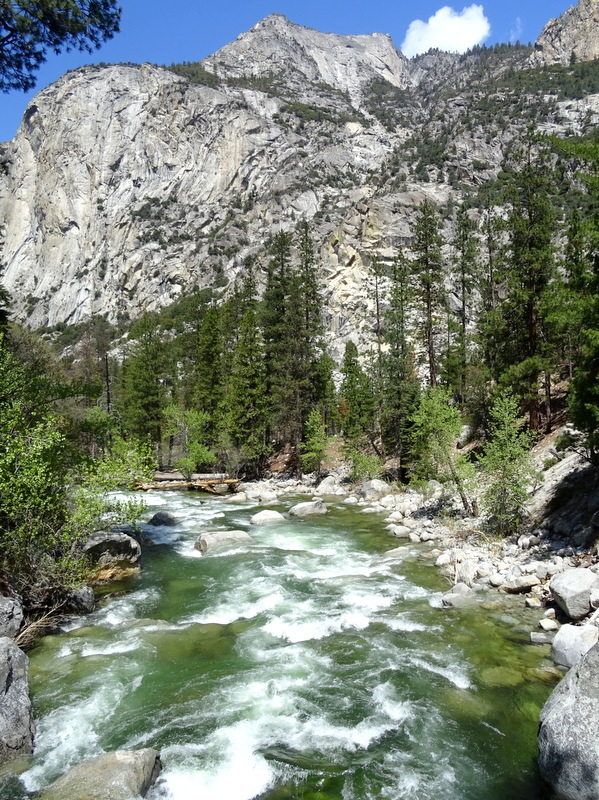 The South Fork of Kings River flows along the bottom of the canyon. 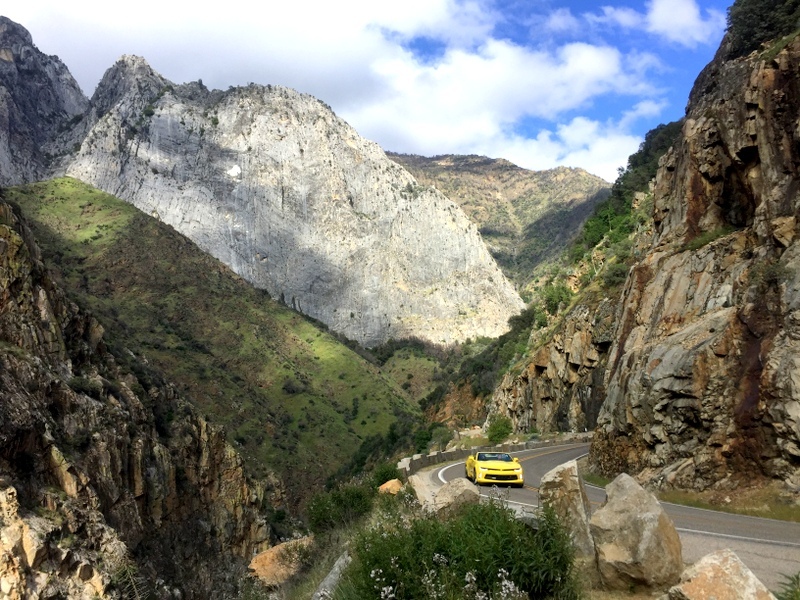 You can drive all the way to the bottom on the Kings Canyon Scenic Byway. 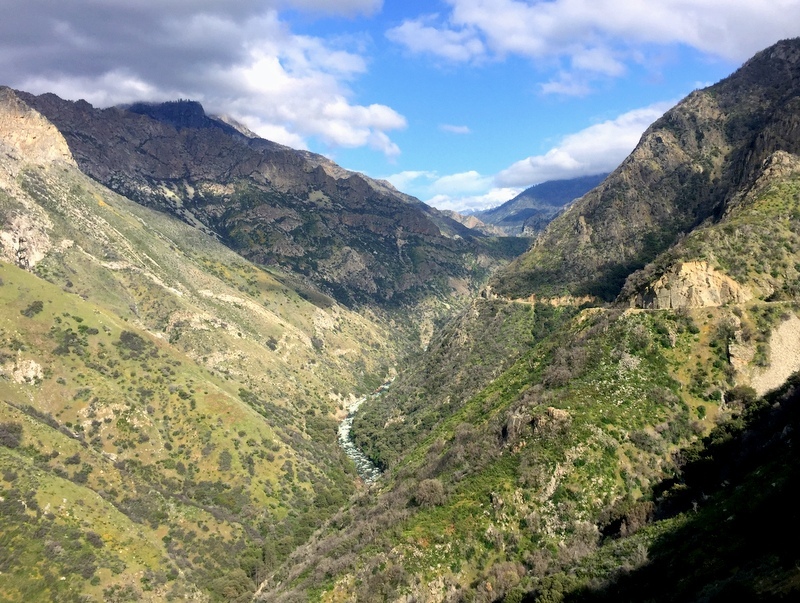 For 50 miles it twists and turns down two thousand feet to the banks of the fast flowing Kings River. The road continues past the Cedar Grove village and a grouping of campgrounds to Road’s End where the auto journey is over. 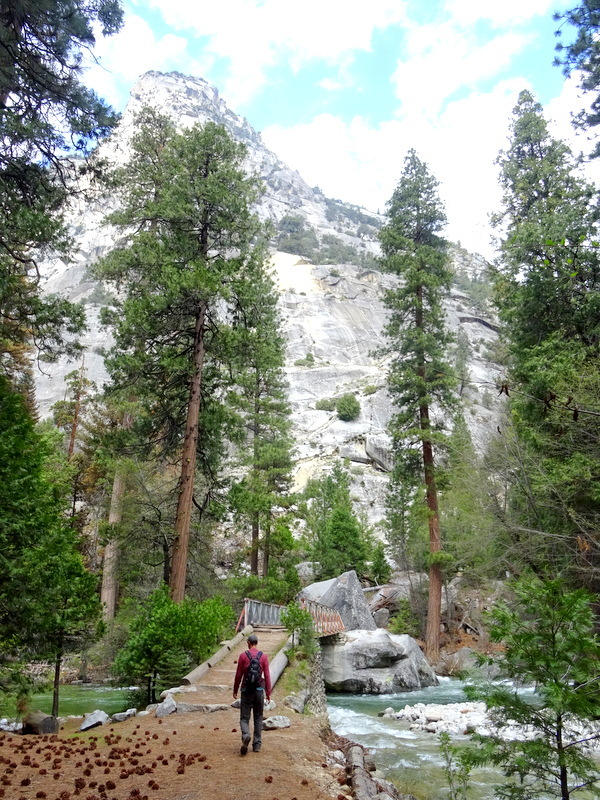 This is a popular jumping-off point for backcountry trips into the Sierra Nevada. By some stroke of luck, the road down to the canyon opened during our week-long stay which meant we had to make the drive. We visited the canyon during our last full day in the park. It was another one of those days when it wasn’t supposed to get out of the 40s and when we left the campground at 10 am it was only 34 degrees. By the time we reached the bottom of the canyon, it was 30 degrees warmer! After shedding winter coats and hats we parked at the Road’s End lot and set out on a hike to Mist Falls. 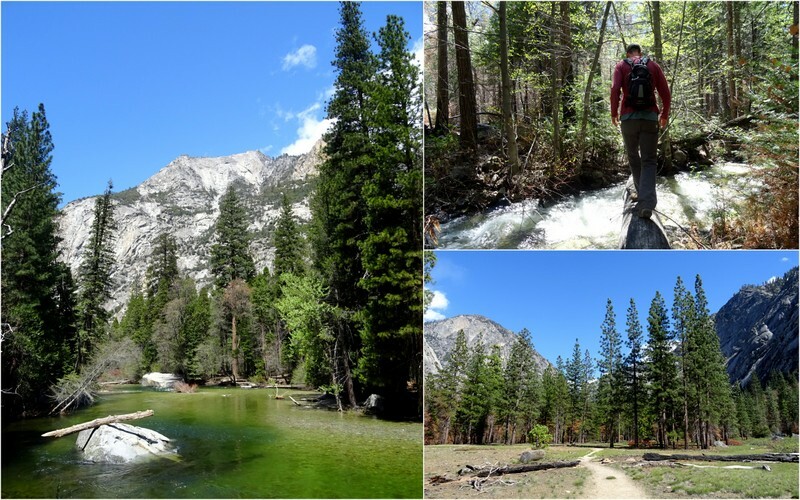 Our tiny little eight-mile hike only offered us the barest glimpse of the wild and rugged Sierras. This is absolutely a place we need to return to someday when we can do some overnight backpacking. I look forward to your travel adventures. Husband and I enjoy camping, and this stop we have not been. So we will be visiting kings Canyon soon. I have one question. When we camp for a week, my refrigerator takes on an order. I use the arm and hammer deodorizer and it still gets a smell. We clean everything before we close it up till the next trip and we leave the door open to the fridge. You being full time campers does this happen to you? And do you have any advice. Thanks for you blog!! I absolutely love reading about your travels. Hmmm…in our 6 years RVing we have only turned the fridge off for an extended time twice. We followed the same steps as you and while there was a little odor it went away quickly after being turned back on and cooled down. I would suggest asking on some RV forums and see if others have advice. Wow! This area is just beautiful! We’ve been exploring southern Utah the last couple weeks and it’s undeniably gorgeous, but I miss me some trees! And those are some SERIOUS trees! We’re gonna head into the mountains of Colorado a little later this summer, so I’ll get my tree fix then, but for the time being, these incredible photos are gonna hold me over. Thanks for the tips on where to go to avoid the masses, too. Hopefully we’ll visit this area later this year and have the same luck as you. As much as I LOVE southern Utah, I always miss trees when we visit. After a winter in the desert and a month on the coast I was craving the forest, and these last two national parks did not disappoint. I suspect that visiting in the fall after the kids are back in school will help avoid the summer crowds. That last hike looks exquisite! I love how baking warms the RV up! Living in a house now in a cool location and it is so different…the oven hardly makes a dent in the chill! Of course, warming up the house can also be a downside. This week we’re at a much lower elevation and the temps are expected to soar into the 90s by the end of the week. That means no turning on the oven! 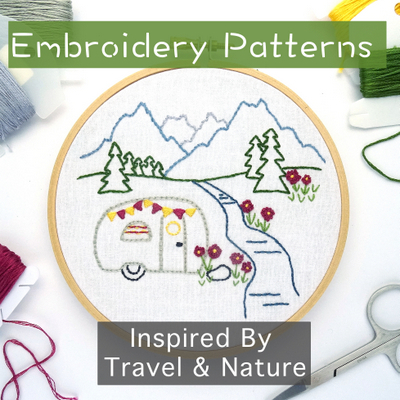 I have learned so much following you! Excited to get out and do our own research. I follow another blogger (the Tinned Sokol’s) that have been just ahead of you on this trip. Happy that we are providing inspiration. We met the Tinned Sokuls about a year ago and I just noticed that they are a bit ahead of us! Never leave a non working reefers doors closed. Clean with ammonia, put a pan of soda in it for a couple days, and follow the above suggestion. Thanks for the great narrative and the beautiful photos. I was in Sequoia in April this year and it was so nice to be there. 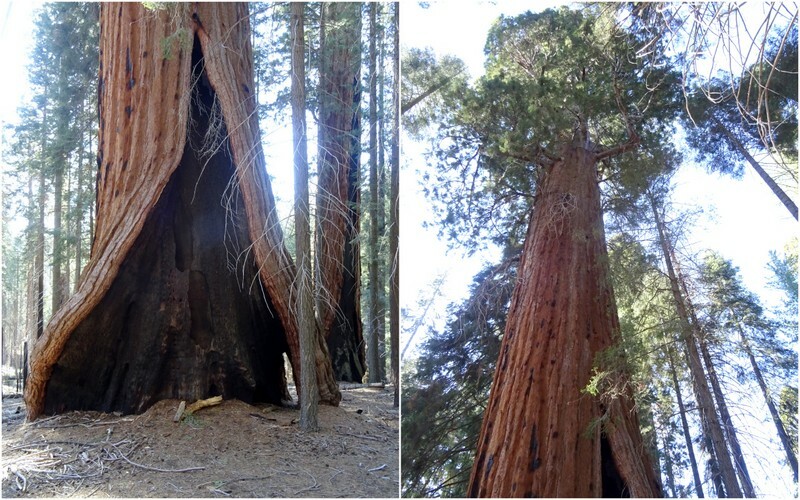 I did leave my Casita in a campground just inside the Three Rivers or southern entrance to Sequoia N P. I almost had an anxiety attack driving the hairpin turns and one lane road construction on the way to see the General Sherman Tree in one of the Giant Sequoia Forests. The trees were magnificent. Nice you had a chance to hike and get the wonderful views. Yes, that road is something! Especially with the current construction. It was a tight squeeze with just our truck. I can’t imagine bringing anything bigger up there. Happy to hear that you enjoyed your visit. They are both such magical parks. 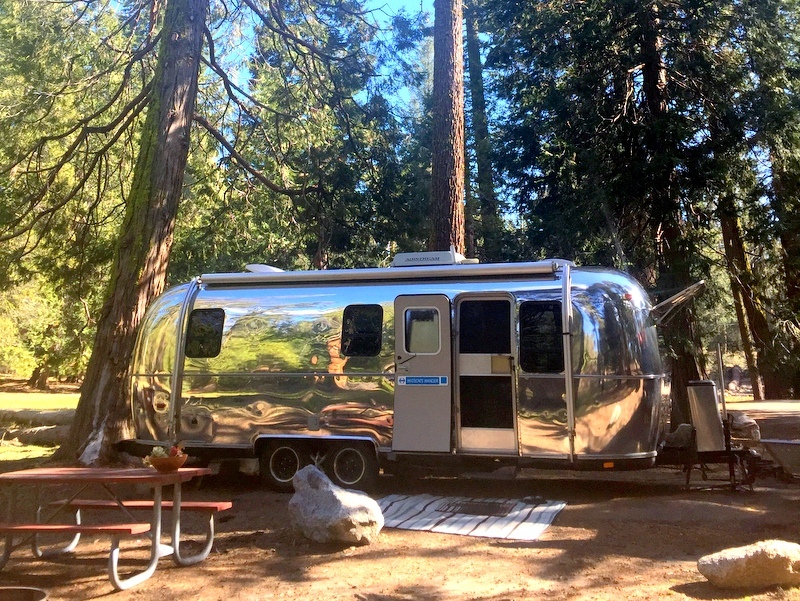 We have taken our old ’92 25′ Airstream up the road from Visalia with no issues. 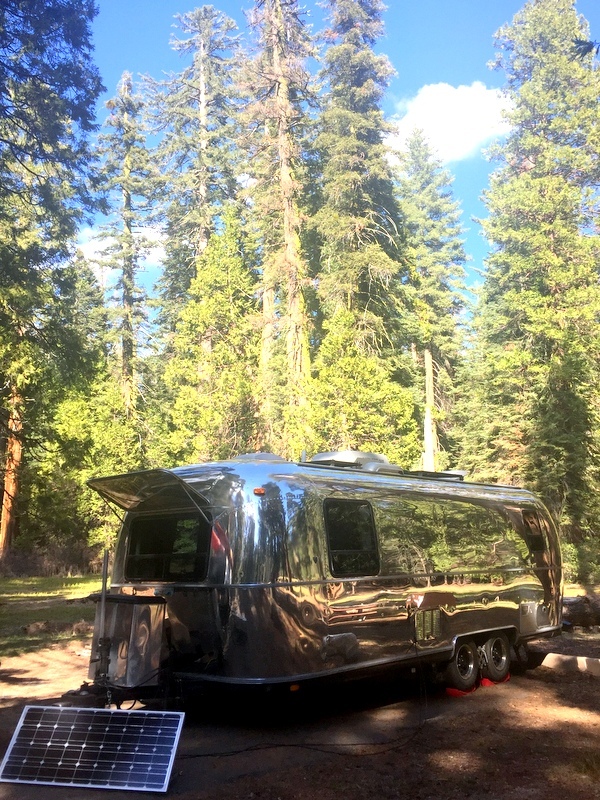 I have not, however, taken our 31′ Airstream up it. 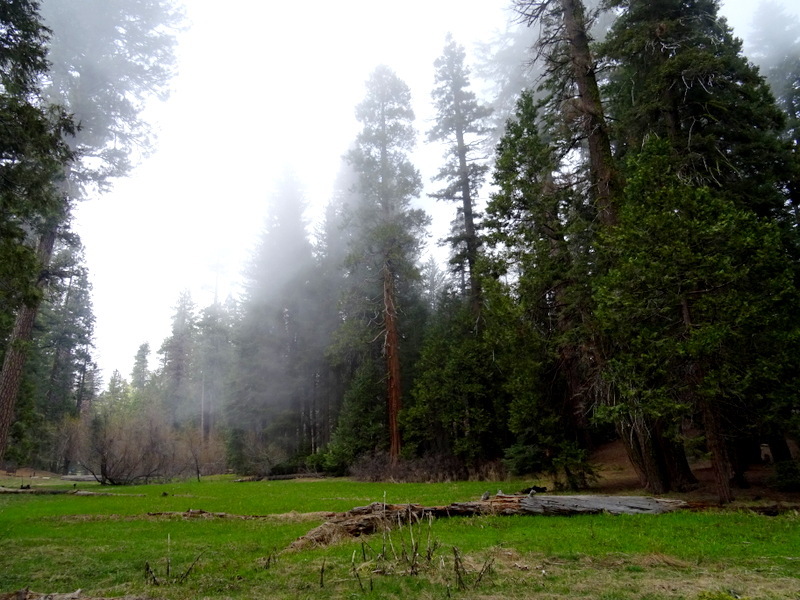 The Princess campground (NFS) on the road down to Kings Canyon is very nice and takes reservations.